Squaraine rotaxanes are mechanically interlocked molecules comprised of a squaraine dye and a tetralactam macromolecule. 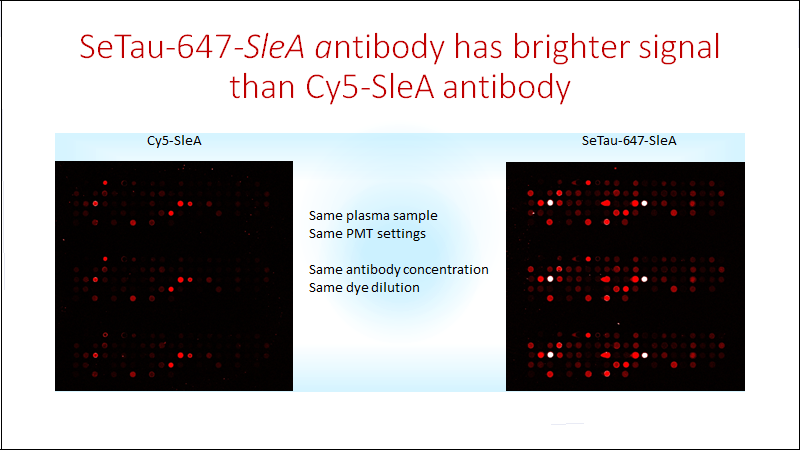 Water-soluble, ionic squaraine rotaxanes were developed by SETA BioMedicals to overcome some of the shortcomings of conventional fluorescent dyes. Ionic squaraine rotaxanes combine several highly desirable properties of fluorescent reporters: extremely high quantum yields in aqueous buffers (up to 65%), high extinction coefficients (up to 275,000 M-1cm-1), very high photostability, large Stokes' shifts (up to 50 nm) and low sensitivity towards oxygen species. Our highly fluorescent squaraine rotaxanes exhibit high chemical stability in particular against oxidative reagents such as peroxides or ozone (see above) and therefore are excellent detection reagents for use in microarrays where the fluorescence signals of cyanine dyes such as Cy5 and Alexa 647 are strongly dependent on the concentration of ozone during post-hybridization array washing. Controlled exposures of microarrays to ozone confirmed the susceptibility of cyanine dyes (Cy5 or Alexa 647) to ozone levels as low as 5-10 ppb for periods as short as 10-30 s.
For more detailed information about microarrays we refer you to DNA and protein microarrays! 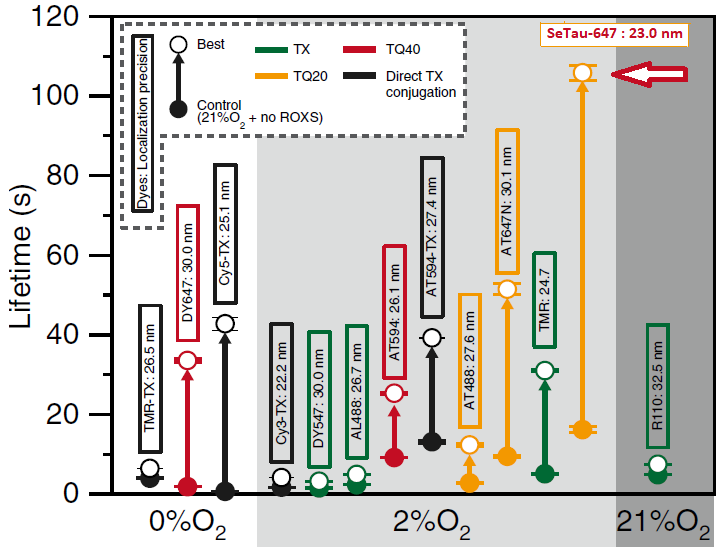 The photobleaching rates of 13 fluorescent dyes, 4 of them conjugated to trolox, were investigated for single-molecule measurements at 37oC in living cells. For this purpose they were linked to a tag protein that was fused to CD47. 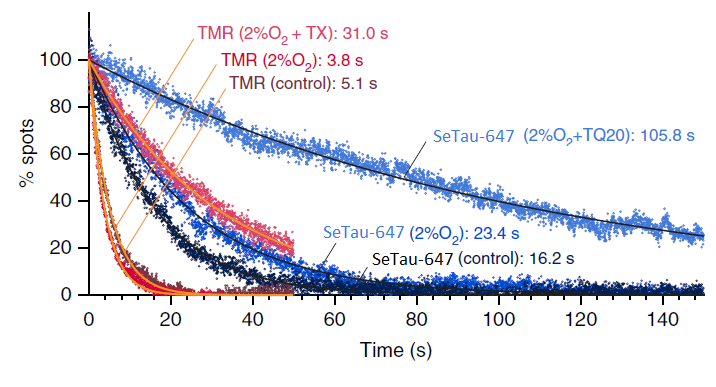 In this study SeTau-647 (K9-4149 or K9-4148) exhibited the best photobleaching performance with an exponential lifetime of 105.8 sec, which is the longest single-fluorescent-molecule tracking ever reported . Photobleaching lifetimes of 13 dyes (including Atto-647N, Atto-594, DY-647, TMR, Cy3-Tx and Cy5-Tx). Time-dependent reductions of the numbers of fluorescent spots found in each 33-ms frame for TMR and SeTau-647 (K9-4148) . Fluorescent squaraine rotaxanes are available in reactive form with carboxy, NHS ester and maleimide functionalities but also as hydrophobic probes for imaging. 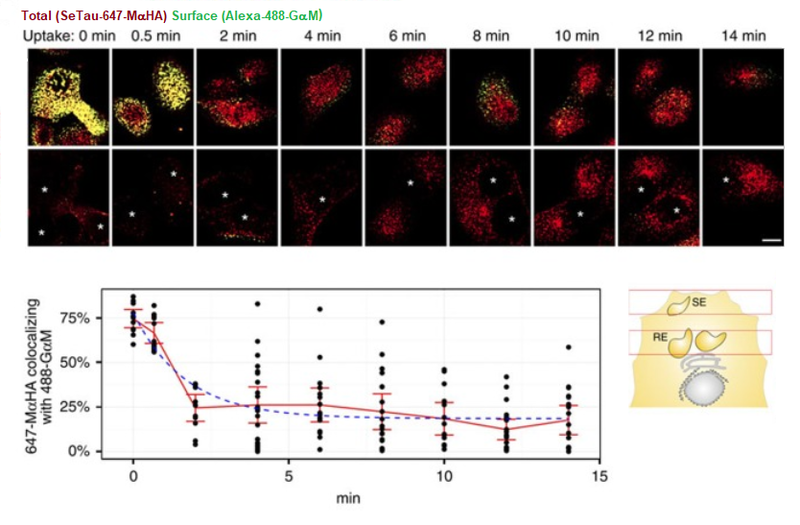 For a direct comparison of the imaging properties and characteristics of Alexa 647 and SeTau 647 we refer you to the following publication: D. Duggal et al. Degree of order and kinetics of phosphorylated (P) and de-P cross-bridges. Am J Physiol Regul Integr Comp Physiol (November 27, 2013): SeTau-647-maleimide (K9-4148) was chosen over Alexa 647 for the above imaging application mainly because it was more resistant to photobleaching and because it is brighter and has a twice as large Stokes' shift (44 nm) compared to Alexa 647 (20 nm). 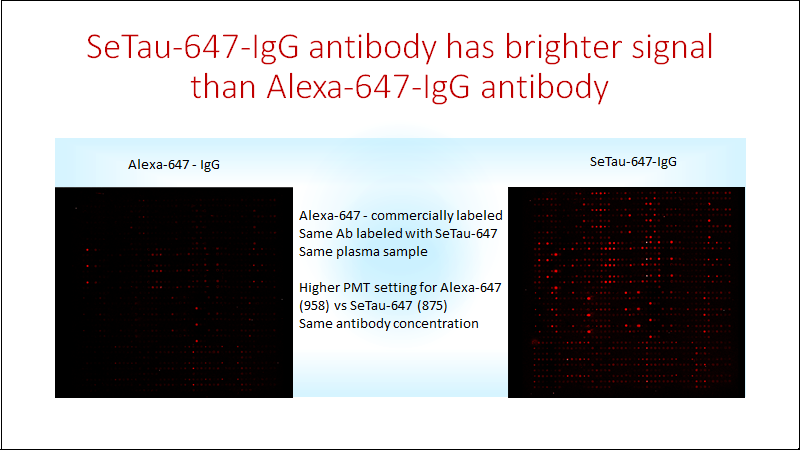 Comparison of photobleaching of Alexa 647 (left) vs. SeTau 647 (right): the photobleaching rate for SeTau 647 was 4.2 times slower than for Alexa 647! 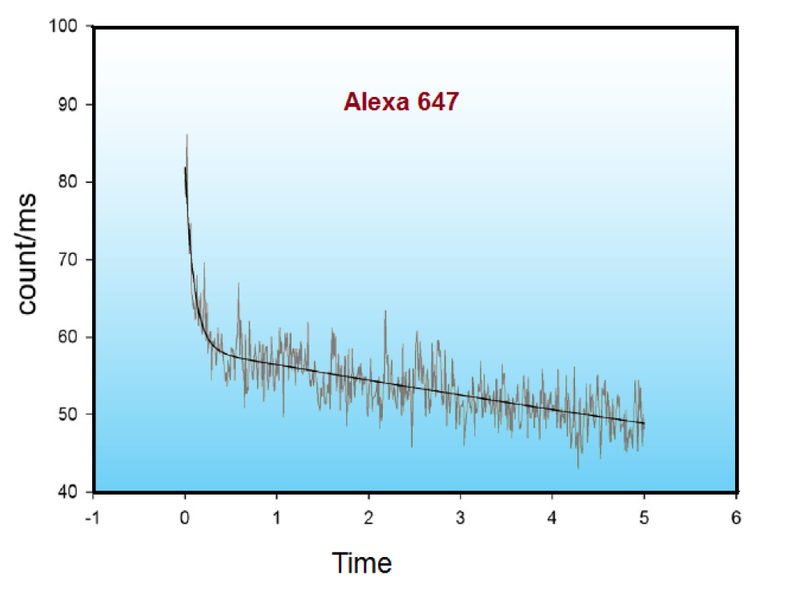 Also the mean count rate of SeTau 647 was about 4 times higher than for Alexa 647. 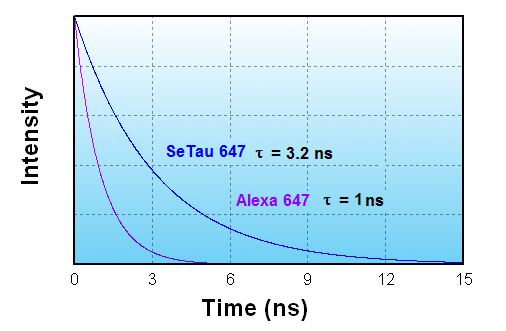 SeTau 680-NHS (Φ = 0.58, ε = 215,000 and Φ. ε = 124,700) with a similar absorption emission as Alexa 680 is twice as bright as Alexa 680 (Φ = 0.36, ε = 183,000 and Φ. ε = 65,880) and exhibits a lower quenching tendency when labeled to biomolecules. Exc./Em. max of IgG-conjugates: 682/703 nm. 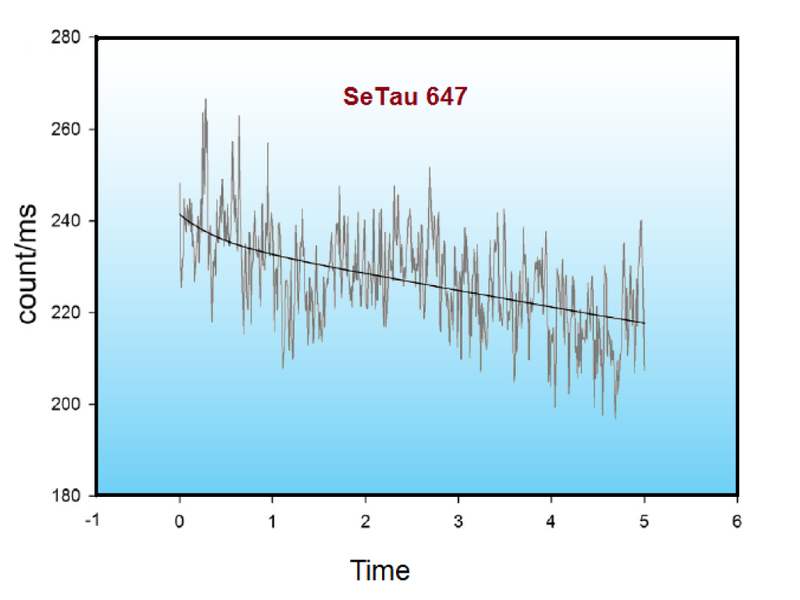 SeTau 670-NHS (Φ = 0.36, ε = 275,000 and Φ. ε = 99,000) with the same absorption and emission as Cy5.5 is about twice as bright as Cy5.5 (Φ. ε = 44,850) and 1.5 as bright as Alexa 680 (Φ = 0.36, ε = 183,000 and Φ. ε = 65,880), and exhibits a lower quenching tendency when labeled to biomolecules. Exc./Em. max of IgG-conjugates: 672/692 nm. SeTau-665-NHS is a hydrophilic, mono-reactive squaraine rotaxane label for biomolecules. It is very bright (Φ = 0.53, ε = 161,000 and Φ. ε = 83,330) with a large Stokes' shift of 48 nm and a similar emission as Alexa 700 (Φ = 0.25, ε = 205,000 and Φ. ε = 51,250) but SeTau-665 is a factor of ~ 1.6 times brighter. It is optimally excited with a 665 nm diode laser. This dye also holds the record for 2PECSs of fluorescent labels with >8500 GM at 900 nm. Exc./Em. max of IgG-conjugates: 665/712 nm. SeTau-647-NHS is a hydrophilic, mono-reactive squaraine rotaxane label for biomolecules. Compared to Cy5 (Φ = 0.27, ε = 250,000 and Φ. ε = 67,500) or Alexa 647 (Φ = 0.33, ε = 239,000 and Φ. ε = 78,870) it is an extremely bright label (Φ = 0.53, ε = 200,000 and Φ. ε = 106,000) with a large Stokes' shift of 46 nm. It is a highly ozone- and photostable dye that is optimally excited with the 647 nm spectral line of the Krypton-Argon laser. Exc./Em. max for conjugates: 649/695 nm. SeTau 647 was used by several research groups at highly reputed universities e.g. at Harvard Medical School where the authors compared 3 imaging probes labelled with Alexa 488, Alexa 568 and SeTau 647 and concluded that SeTau-647 has near ideal in vivo imaging characteristics and at Weill Medical College of Cornell University where quantitative live-imaging with SeTau-647 (K9-4149) and mathematical modelling was used to outline the recycling pathway of the Megalin (LRP-2) receptor in MDCK cells (see below and relevant publication in Nature Comm. 2016). The longer lifetimes in the order of 2 - 4 ns (see below), and larger Stokes' shifts (40 - 50 nm) of squaraine rotaxanes compared to conventional cyanine based NIR labels (τ = 0.5 – 1.5 ns) make them in particular suitable as labels for use in fluorescence polarization immunoassays. Squaraine rotaxanes have unique properties for 2P imaging applications with two-photon action cross sections (2PACS) in the order of up to 10,000 GM: see (K. Podgorski et al. 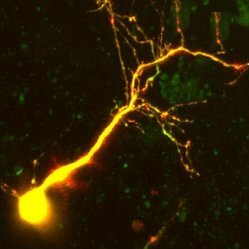 Ultra-bright and -stable red and NIR squaraine fluorophores for in vivo two-photon imaging. PLoS ONE 7(12): e51980). Our fluorescent rotaxane probes exhibit extremely high chemical and photostability and are therefore well suited for imaging applications. They also have extremly high 2-photon action cross sections in the order of several thousand GM. SeTau-633 is a carboxylic acid ethyl ester derivative that passively penetrates cell membranes. Once inside these residues are hydrolyzed by esterases thereby forming carboxyl groups that are cell-impermeable. 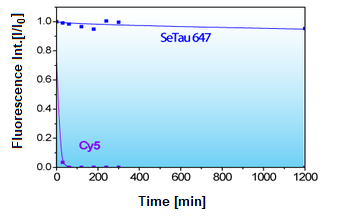 SeTau-647 is a highly water-soluble fluorescent probe with several negative charges and therefore will not passivele penetrate the cell-menbrane. This probe is very photostable and has a quantum yield of 60% in water.